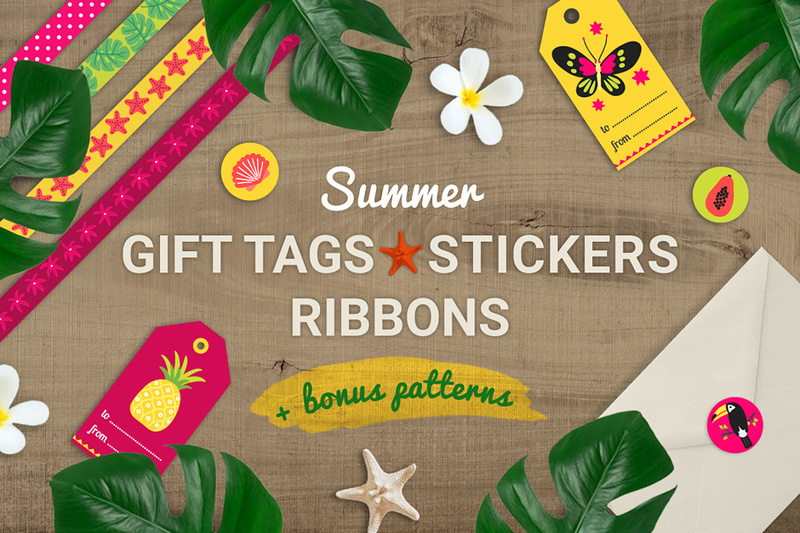 Introducing a collection of fun summer elements including gift tags, stickers, seamless ribbons and seamless patterns in a variety of colors. The elements illustrated include monstera leaves, toucans, cockatoos, butterflies, insects, pineapples, papayas, fruits, tropical flowers, dragon fruits, shells, starfishes, avocados, coconuts, flamingos, birds. Summer decorations. Seamless ribbons with polka dot, diagonal lines, stripes, pineapples, avocado, shell, leaves, starfish and triangles. Perfect for decorating summer gifts, holiday letters, creating collages, albums, greeting cards, glassware, candles, home accessories and more! Software compatibility: Adobe Photoshop CS4 and Illustrator CS1 or newer, .JPG and .PNG files will work with most graphic software, .EPS files will work with a variety of programs such as Adobe Photoshop or Illustrator, Sketch, InkScape, Affinity, Corel Draw, etc. 3 seamless patterns in .EPS8 and .JPG formats. File size is approx 13.4MB (18.2MB unzipped), offered as a single download.